Maple Wood grain with Indigo DÃ©cor. This little unit is sure to please with its Aluminum Cage Contstruction including roof & floor, vacuum laminated 1 piece roof and walls, enclosed underbelly, 4 mounted stabilizer jacks, dexter torflex torsion axles, nitro filled radial tires, polished alloy wheels, led tv w/ multizone stereo with dvd/cd/am/fm and blue tooth control, outside stereo speakers, 13,500 btu ducted roof ac, pre wired for back up camera and solar, night shades, undermount kitchen sink, solid surface kitchen countertops, recessed cooktop with flush mount cover, roller bearing drawer guides, microwave, double door refer with raised wood panel doors, gas/electric water heater, A&E Awning with Led Light strip, Spare tire with carrier, outside bbq grill, black tank flush, bonded windows, wifi ranger wifi booster, Champagne Exterior with color keyed roof, Maple Cabinetry with Solid Maple cabinet doors, Power Tongue Jack, Wood look floor, Gas Oven, Heated Holding Tanks, rear ladder, heated mattress, hide-a-bed option, water purifier, two maxxair vent fans with covers. Come on down and check out our inventory!! Buy From a Family Owned and operated business since 1996! Where customer service is #1 before, during and after the sale! 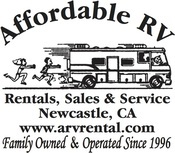 Affordable RV's is a family owned and operated business that was established 1996. Customer Service is number 1 so you are sure to get the attention and service you are looking for at Affordable RV's. Should it be Sales, Parts, Service or Rentals Affordable RV's is your one stop shop for anything RV related! We are a certified warranty facility for Tiffin Motorhomes, Fleetwood, Forest River, Thor, Keystone, Monaco and many more!! We specialize in Aqua hot repair, Dingy Tow Set ups, Fifth wheel hitches/installations, Appliance service/Repair, 12volt diagnosis/repair, Satellite Installs/repair, Solar panel installs, inverter charger diagnosis/repair and much much more!! Stop on in or give us a call with any questions and we will be happy to help!